A floating tyne design offers unparalleled safety for skid steer loaders. Unlike forklifts, skid steers are able to crowd their pickup past horizontal allowing the machine to be placed in an unsafe position which could cause it to tip over. Furthermore, putting the machine’s weight on the tynes may cause them to weaken or break. Digga’s pallet fork design allows the tynes to swing freely from a single fixed point ensuring load and operator safety. If you care about safety then a floating tyne design is the only safe choice for skid steer loaders. Machine Suitability: Suits skid steer loaders, front end loaders, and Compact Telehandlers. 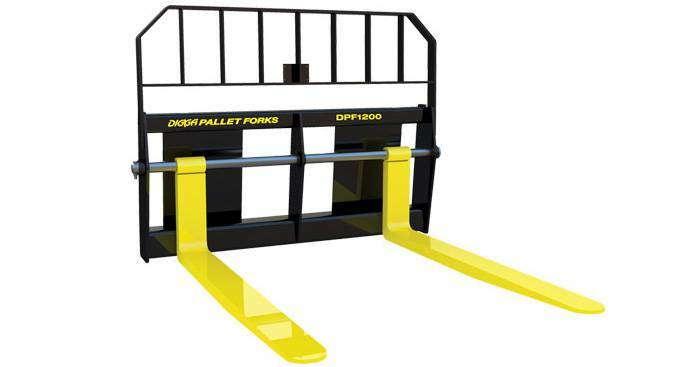 Digga’s pallet fork design allows the tynes to swing freely from a single fixed point ensuring load and operator safety. For pricing or more information about the Pallet Forks fill out the form and we&apos;ll be in touch soon. Alternatively call (08) 9457 1544.